Rear View Mirror: The Goody’s Fast Pain Relief 500! After going LIVE from Victory Lane I stepped into the broadcast studio in the Media Center, put the headset on, flipped on the microphone and the phone lines lit up after the running of the Good’s Fast Pain Relief 500. Callers from Arizona to Oklahoma and from Canada to Texas wanted to talk about the short track racing that we saw at Martinsville Speedway. The fans had a lot to talk about, from caution calling to fender bumping, but the one common element was how refreshing short track racing is, jam packed with action. Martinsville, after a brief pause for rain, delivered. Jeff Gordon Almost Wins Again! Feels he got a cheap shot – wanted to see the replay. As always, you’ll have conspiracy theorists – heck it’s part of the DNA of NASCAR racing to argue about conspiracies. It’s every man for himself at the end of this race though – and that’s what we saw. Of course. those who were not Gordon fans said he should not have complained about being hit when everyone was hit by someone at Martinsville. Jeff Gordon was a little upset himself but didn’t erupt in anger, just said he was disappointed, not totally unhappy with a third place finish, and wanted to wait until he saw the replay. It’s amazing to me the restraint Jeff shows when he’s upset – never walks away from a media question, and even tried to say initially that “someone” hit him from the back – even though he knew it was Matt Kenseth and eventually did use his name, but even after that, one more time said he wanted to see the replay. “I got an okay restart. Spun the tires a little bit, got going. I looked at my mirror, 17 was pretty far behind me. Made sure I didn’t drive in too deep. Next thing I know, I got nailed. I don’t know who got into me. I thought it was the 17. If it wasn’t, I apologize to him. 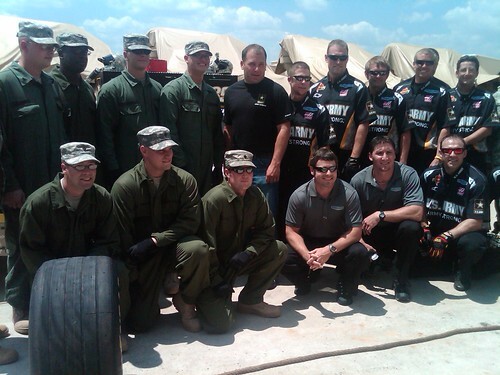 I made sure he didn’t win the race down the straightaway,” Gordon said. Interesting, he didn’t want to name him before seeing the replay but he “made sure he didn’t win the race down the straightaway.” Yep Gordon Knew it was him, I just don’t think he wanted to call him out. I got into Jeff a little bit – really not that hard! Matt is a veteran of short track racing, and he knows how the game is played. He’s not one to complain he’ll usually say what he has to say behind the wheel and on the race track. Jeff Gordon thought that the past short-track frustration history between he and Kenseth was over. Now he’s wondering. That’s what makes short track racing so much fun for the fans. Edwards was the meat in the sandwich! Denny Hamlin remembers the race fans! I’m LIVE in Victory Lane when the race is over, so I’m in the happiest place on earth every weekend. This weekend though, I watched a demonstration by the race winner as to how to celebrate a race WITH the race fans. As I’m standing in Victory Lane, with (#11 FedEx) crew chief Mike Ford, I look over to the #11 car. He totally blew the tires off that car with the burnout and the team was trying to lift the car (which was banged up like a demolition derby entry at the state fair) and get it up so they could get tires on it and get it off of the front stretch. After some red-faced lift attempts by the entire team, a NASCAR official jacked the car and the guys got it rolling and back to the garage. Mike Ford told me that when he told Denny about taking four tires, Denny said “10-4″ indicating they were in it together on the decision. Ford told me that some drivers will give a vague answer so that the crew chief is the hero or the zero on a call like this -but in this case Denny gave his crew chief his total support, something that Ford appreciated. After doing the hat dance, Denny bolted across the track to the race fans to spray champagne on them and the fans loved every single, champagne soaking moment. To do that Denny had to leave Victory Lane and cross the track go through the fence, up some stairs and to where the fans were pushing up against the fence in excitement. I’m standing by ready to interview Denny LIVE on SIRIUS NASCAR Radio after he returned to Victory Lane for more photos, when Denny indicated I should come with him, and since I was just going LIVE and introducing him on air, I followed him as he returned across the track, back up the stairs, and to the fence where the fans were. He took a whole stack of Victory Lane caps and was signing them and handing them out to the race fans. This is a Denny Hamlin that fans will get to know better over the years and a guy who knows how important these fans are. He’s good about giving tickets away during the week to race fans – but to remember them in the charged-up, everyone-wanting-something, crazy and frenetic excitement of Victory Lane is really something special. I salute Denny Hamlin for what he did during his moments of celebration. I was standing there LIVE with him at the fence across the track as the fans screamed and shouted his name and, no matter which driver they follow, I’m sure they will never forget the moment. That was way cool of Denny, and we wish him good luck on Wednesday’s knee surgery. Did Denny Hamlin bully his way to a win? Come on people – it’s short track racing! Some of the callers who were fans of other drivers asked about how fiercely Denny Hamlin battled it from his pit stop for fresh tires to win the race. Leaving the media center, I heard one reporter say, ” NASCAR the fans love ‘have at it’ unless someone is having at their driver – then it’s not so much fun.” That makes sense, it’s understandable. It’s called being a loyal fan. But short track racing has always been gouging your way to a win. You’ll have that in short track racing! So let’s talk about the caution at the end of the race that took the Good’s Fast Pain Relief 500 into a green white checkered situation. Gordon cruised under green and Hamlin drove three-wide into Turn 1, battling his way to fourth on fresh tires. Then, another caution was thrown, this time it was for Kyle Busch’s spin in Turn 3 with just over a lap remaining. NASCAR makes no bones about the fact that they want the race to finish under green and multiple green white checkered flags will be used to ensure that. Ok, so at the end of the race cautions might not be called as quickly when NASCAR thinks the race will still end under green – and we can debate that all day long. As the race is nearer to conclusion – it does seem that the cautions are called more quickly if there’s a chance the race will end under yellow without the caution. The object is to end under yellow. Sometimes the late race caution will bite your team, sometimes it will favor your team. While I won’t begin to argue constency when it comes to cautions, since it’s a judgement call, it’s about the finish under green in my mind, and not which driver might win, or not win the race as a result. If Kyle Busch had not had wrecked Jeff Gordon probably would have won the race and without double file restarts Denny would not have had a chance anyway-as he came from fourth place to win in two laps. That’s to say nothing of the #11 team choice to pit for four tires, and the chance that Denny could have lost the race because of that call. I love short track racing! It’s a beautiful day in Charlotte, North Carolina – enjoy the day! Did you hear me interview Jamie McMurray this weekend? He was sick as a dog – said that last Wednesday he was so sick he could not have driven a race car. He actually had to have the hotel doctor make a room visit. I interviewed him – and a bunch of other race car drivers who were sick. Sunday night – about an hour before I finished the post race show I felt like I was hit by a truck filled with the flu. I was on the air when it came on and it is the only time in my life I felt like I knew exactly within the hour when I got ill. I barely left Vegas. If you were on the Vegas rental car shuttle and you saw a girl with her head on the rail of the shuttle that was me and it wasn’t a party that put me there . Honest, I was so weak that I had to ask people to help me. I ran into a listener who introduced herself and since she didn’t have bags she asked if she could help pull my bag, it was obvious I was about to keel over. I usually would say. “No thanks I can handle it,” but this time I could not. It was a good lesson cause I have never had to lean on others — I hated the feeling. So I let people help me get my luggage on and off the shuttle, and onto the airplane and the overhead. Blessings to everyone who helped me seeing how sick I was. I really don’t know how I got home without the help of others so thanks to the unnamed to helped. I was never more thankful to get home. I met the nicest people on the West Coast and they seemed so happy. Not trying to create anything artificial – I just felt as I met the fans on the West Coast that they were so appreciative and happy that it put me in a good mood and I just totally felt it when I met them. They came out late at night to watch the haulers, they screamed and jumped and got excited and were thrilled to be there and soak up every single small moment of the NASCAR circus being in town. I’m wondering if we’ll see the same at Atlanta this weekend. I know it’s a different market. To me- it’s not all just about numbers of people –it’s the fans’ enthusiasm. Atlanta is a market that I would assume would embrace NASCAR as NASCAR has it’s roots in the deep south. Maybe that’s why sometimes it seems as if Atlanta takes NASCAR for granted. If you live in town maybe you don’t go to see your parents much as if you treasure moment with them when you live close. I live in Charlotte, NC and my parents and brothers and sisters live in Wisconsin so I miss them all the time and stay in touch more than they do even though they live closer. Maybe it’s that kind of thing. If the weather is nice I would hope Atlanta would show up big time this weekend- and have some fun – the kind of fun I saw people having in California and Nevada. I’m not selling this – I’m simply observing. You can’t fake pure joy– and boy is it catching. I am just interested in what we see in Atlanta this weekend. By the way the weather forecast looks pretty good. Subject to change of course. Observations – Check it out! Scott Speed: I caught up with him at the care center after the Nationwide race on Saturday- at LVMS and was so impressed with his presence. The first few times I interviewed him he said he’d do his best in this sport and whatever came to him came to him and he wouldn’t worry about it. I was like “yea right.” I never saw a racer who made it with that attitude. But you know after getting whacked on the track and starting from the pole and just getting our of the care center- he had an inner peace I don’t usually see of drivers there and I have seen a lot of them there over the years. It was pretty impressive. I ran into him pre race and walked with him. He was so focused and had an inner calm. This guy seems to keep his head together and stay focused when the world is swirling around him. Could that translate to success on the track? We’ll see. Interesting to cover him this year. Jeff Gordon: His fans have sent me so many emails. Have I seen a change in him? Not really – he’s always been appreciative of being in the sport – and he’s always had the fire to win. He is felling better this year and I think it shows in his driving. His back was an issue – no longer. 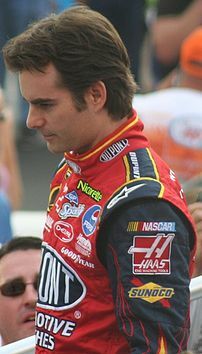 Can it be true that Jeff Gordon was 23rd in points after Las Vegas last year. Woah. The SMI tracks are starting fan (PRN up to Speed) events with drivers on stage and when Jeff Gordon was asked about it he was the first to say yes he’d do it. I heard a story told to me the other day from a track official about Jeff and a guy who had a terminal disease. Not only did Jeff meet the guy but knew exactly what to say to someone who was dying…..the track official was in tears telling me how Jeff handled the situation with grace and deep sincerity and kindness but also with a deep faith, from the spirit, the heart. It’s good to see him figure into the story lines this year. Carl Edwards: The man is really made of steel. He doesn’t flinch his timing is perfect (It’s the one characteristic I see in all champions). They don’t laugh at the wrong time or say the wrong thing at the wrong time or miss the timing in an interview. Sometimes in a pack of reporters when I leave the pack after getting what I need he will tap me on the arm as if to say thanks Claire for coming. He doesn’t miss anything. He’s always pleasant and on his game. The other day, I interviewed Carl while walking and fans noticed him – they came running and were talking to him and handing him things and we changed directions twice and he kept talking doing an interview. I always notice how his focus is about as strong as anyone I’ve ever seen. Dale Earnhardt Jr: I have been covering him since he began in this sport. Usually I would use the word “respect” to define him. In previous years I would have always used that word when asked about him- more than any other driver. I am not seeing Dale Junior as the poster child for respect this year -yet. That is not a knock at all. He’s still a really nice and decent guy up close. I think he’s testing the lines of “too nice” and “I gotta show respect -not act a fool” that he learned as a child afraid to knock anyone around and pushing into “Damn I gotta get the job done and nice might not get me there.” Dale Junior has always been true and real -as I have seen in covering him and I would guess that he might be figuring out who he really is and how he wants to be as he grows at Hendrick so that he can be real about it. Cause he’s not going to give us anything fake. We’ve never seen any less from him. I remember the day that Martin Truex got his first Busch series championship and I went up on stage. Not bothering him I figured as owner I would not ask him too many questions. I said, “I hate to be a pain – but I’d like to talk with you.” He said quietly, “You’re not being a pain.” I never forgot the kindness because he didn’t need to say that. It was years ago – but it stuck with me. Or the sunglasses he designed that had the word “respect” on the tag. I knew that word was ingrained in him. Dale doesn’t like loud but if you are not asking for much he usually will do what he can to make time and he digs deep usually. I hope he doesn’t change that as he grows up. He’s a really decent guy. He’s just stretching. Well that’s about all the observations I have now. I’ll talk to you more later. I need to get some sleep and fight this flu so that I can be ready to leave Thursday crack of dawn for Atlanta. To the anonymous people who I had to lean on getting home from Las Vegas: Thanks. You can’t imagine how sick I was and how much you helped me get home. You helped a stranger and I send you many blessings.